A dead man on a Ferris wheel and a cold-case murder take Cavendish Brown into a world of carnival freaks, ghosts, and killers. The annual carnival comes to Maiden Falls, a small town in the West Virginia Mountains, but everything is not merry. The ghost of a woman appears to Cavendish Brown, a carnival worker lies dead aboard a car on the Ferris wheel, and a bullied teenager plots to kill people at the carnival with a homemade bomb. More complications arise. Cavendish again butts heads with the local sheriff, Clinton Pike. Marbella Wellingway, owner of the newspaper where Cavendish works, receives a visit from the Angel of Death. And a Fortune Teller at the carnival knows something that could forever change Cavendish’s life. With the aid of Jane, a disturbed psychic, and Alexandra, a Goth witch, he must find the killer, help the mystery woman, and risk his life to prevent more deaths. 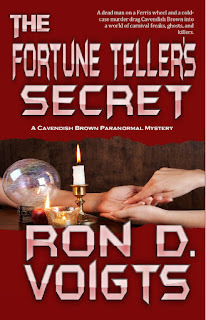 Book #2 in the Cavendish Brown Paranormal Mystery series brings readers a fast-paced thriller of suspense and the supernatural.